Friend? Foe? Neutral? Real Life Example #1: I had a Dr. appointment the other day. While waiting in line to check in with the receptionist I noticed three really wonderful flower arrangements on the desk, one for each attendant. When I commented to the woman behind me how lovely the flowers were she smiled and agreed. Moments later, I arrived to the front of the line and overheard another woman ask the receptionist where the flowers came from. The receptionist said verbatim, “They are beautiful aren’t they. It’s interesting because we typically don’t have flowers here, so we’re really enjoying them. But, I have no idea where they came from”. WOW, I thought to myself what a missed opportunity. Even though they didn’t realize it and clearly the florist didn’t realize it either, all three receptionists represented the florist’s extended sales force and none of them could provide the potential buyers in the line with contact information for the florist. I categorize the receptionist as “neutral”. They complimented the florist but didn’t add any value to the florist’s business. In this instance the florist itself was its own worst enemy. The florist should have provided each receptionist with a card and suggested that they take the flowers home on Friday to enjoy themselves. Simple. this hotel. She boasted about Gordon Ramsey’s restaurant in the lobby area, FREE afternoon tea, free breakfasts, a room on an upper floor with a spectacular view of the East River, the sites and sounds around the area and more. I was sold. Her category: “FRIEND”. Category of the hotel: “FRIEND”. This is a fantastic example of how to effectively use an extended sales force. Clearly London NYC had provided the travel desk with specific and detailed information about their hotel features and benefits and an overview of notable local attractions. And, on the flip side, the Travel Desk had the appropriate systems in place to capture and disseminate the information. The net is we all have extended sales forces representing our business whether it’s a client, a vendor or a formal sales team. We need to ensure that these individuals are empowered with the tools to effectively sell our business. If not, we either won’t get the referral or if we do it will be a poor referral where we’ll be relinquished to compete on something else other than our core benefits – like price. 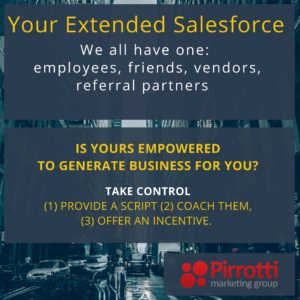 Do you have best practice that you use for your employees, partners, vendors (your extended salesforce) that you would like to share? We would value your input. And, if you like this post please help spread the word (share / retweet / comment etc..). Even better, go ahead and sign up for Be Smart About FREE. Use coupon code besmart2018 at checkout!